Cooking class can be so much fun! Pretty sure we have just as much fun, if not more, than our students. Classes at VSpicery are all about demonstrating how to create maximum flavor with minimum effort. 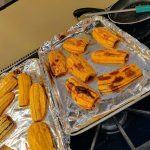 We love to answer questions about cooking techniques, and regularly help our students and customers perfect everyday dishes that wow the diners around their family tables. 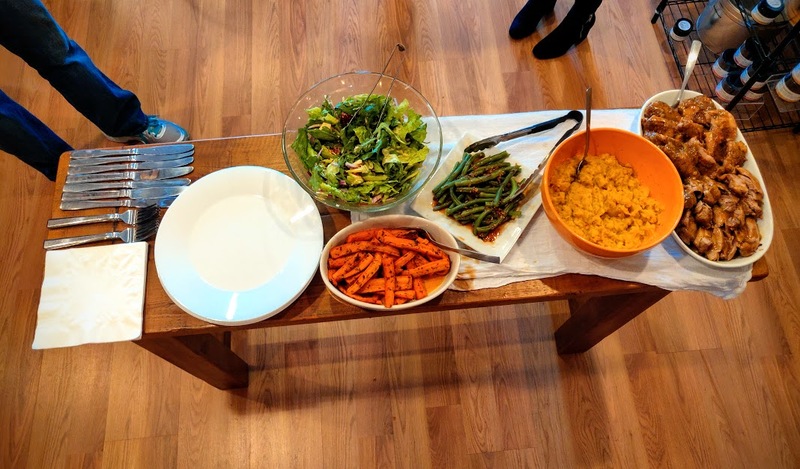 In our November cooking class, we had some tasty alternatives on the menu for holiday dishes, and the results were delicious. We began with a simple and flavorful salad that pairs beautifully with fall and winter menus. 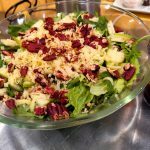 To make the salad we added granny smith apple chunks, sliced red onion, shredded sharp cheddar cheese, and toasted coarsely chopped pecans to a bed of fresh romaine and arugula lettuce. The sharpness of the cheddar cheese nicely balances the tart apple flavor and nutty toasted pecans, making this salad a serious taste bud teaser. Next, we made our maple orange dressing using our Maple Flakes, maple syrup, honey, Himalayan Pink Salt, Green Peppercorns, Apple Balsamic Vinegar and Seraphino Greek Organic Olive Oil. 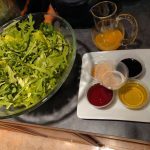 We developed this dressing for our previous salad class, and it has quickly become one of our favorites! 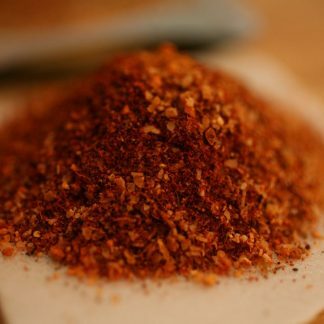 Our dried maple flakes are key to giving this dressing a delightful maple kick. The orange juice brightens the dressing and balances the acidity of the vinegar really well. Once the ingredients are mixed together well, and emulsified with olive oil, it’s ready for serving. Our class moved right along to the main course with Herbal Crust Turkey Thighs. 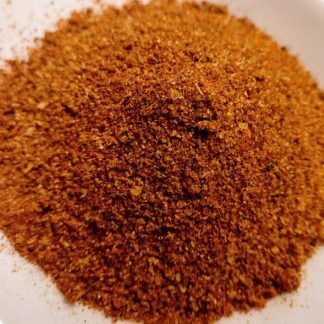 VSpicery’s Herbal Crust Seasoning was developed specifically for roasted meats, including game meats like venison. This blend is perfect for your holiday bird, and the pan drippings make the best gravy we have ever made. 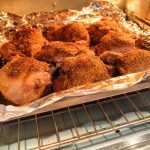 We normally roast a whole turkey for our Thanksgiving meal, but using turkey thighs is just as tasty. Turkey thighs take less time to cook, are really flavorful and no carving is needed. All you need to do is lightly coat with olive oil (or any oil of your choice), add Herbal Crust Seasoning, and bake. We tend to prefer using bone-in, skin-on thighs, since roasting with the bone in gives much better flavor and the skin keeps the meat moist throughout the roasting process. After the turkey thighs were cooked, we took the bone out, and sliced each thigh into 3 nice sized chunks. You can serve it with or without the skin. We rounded out the meal with some yummy side dishes that are super easy to make, healthy to eat, and diet friendly. If you haven’t tried Delicata Squash yet, you really should! Delicata Squash is low in calories, and has a thicker consistency than other squash varieties. This is the perfect alternative to high carb sides like mashed potatoes or sweet potatoes. All you need to do is roast the squash in the oven with a little olive oil, salt and pepper, and roast cut side down. Once cooked, scoop out the meat of the squash into a bowl and mash it up with our new blend, Sunny Soiree, some butter and a tiny splash of heavy cream, then season to taste with salt and pepper. You can also add a little goat cheese, if you want a creamy tang of flavor, but it’s entirely optional. This simple dish will quickly become a go to side for any meal. For the final two sides, we made steamed green beans and roasted carrots. 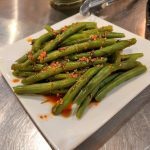 This may sound uninspired, but as usual, VSpicery takes the bland and unexciting to flavor heights that will make you crave these healthy veggies regularly. After steaming the green beans, we made a simple warm vinaigrette for them. We used our Champagne Pear Vinegar, Yellow Mustard Powder, Shallots, Honey and Himalayan Pink salt. We poured the vinegar into a sauté pan on medium heat, and added the rest of the ingredients as it warmed up. When vinegar mix is just coming to a boil, remove the pan from heat, then pour the mixture over green beans just prior to serving. The last side dish we made was Spiced Roasted Carrots. We started by quartering the whole carrot sticks, then tossed them with olive oil, salt and pepper, and thyme. While the carrots were roasting, we softened some butter and stirred in cumin, coriander, turmeric, and aleppo pepper. Then, we tossed the roasted carrots in the spiced butter and transferred them to a serving platter. You can use cumin and coriander ground powder, but you get a deeper nuttier flavor if you lightly toast the whole seeds, then grind them down before adding to the butter mix. 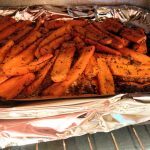 This carrot side dish also pairs really well with roasted meats, baked salmon and pork. Last, but definitely not least, is the gravy! As mentioned above, the pan drippings from roasting the turkey with Herbal Crust Seasoning is what makes this so incredibly good. Just make gravy as you usually would by adding the pan drippings to a sauté pan over medium heat. Stir constantly, while thickening it with flour to your desired consistency. For this class, we used a gluten free flour to accommodate our student’s dietary restrictions, and it turned out great! We discovered how tasty this gravy is a few years ago while cooking a Thanksgiving feast for a catering client, and now we look forward to it every year. If you want to read more about it, check out our original Tasty Gravy blog post. That’s it for this class menu! This meal can be ready in a fraction of the time that it normally takes to fill up your holiday table, and will work for just about any diet. Treat your family to a healthy, quick and incredibly delicious holiday meal this year. VSpicery is here to help you with all of your flavor needs. Keep an eye out for our next class offering! We try to schedule at least one public class a month. You can also book your own private demonstration. We just need 6 or more to put your group on our kitchen calendar. We can create a menu for your private class, or you can choose. Call us at the shop 813-870-1133 for more info. Next post: Here’s to VSpicery’s 16th Anniversary, the New Year and a dinner full of love. You always surprise me with your spices and recipes. Hope all is well with you and the family. Hope to see you soon. Thanks so much, Liz! Family is doing well, and looking forward to spending time with them over the holidays. We hope you and your family are doing well, and definitely hope to see you soon!